Ewwww! What is that Smell? 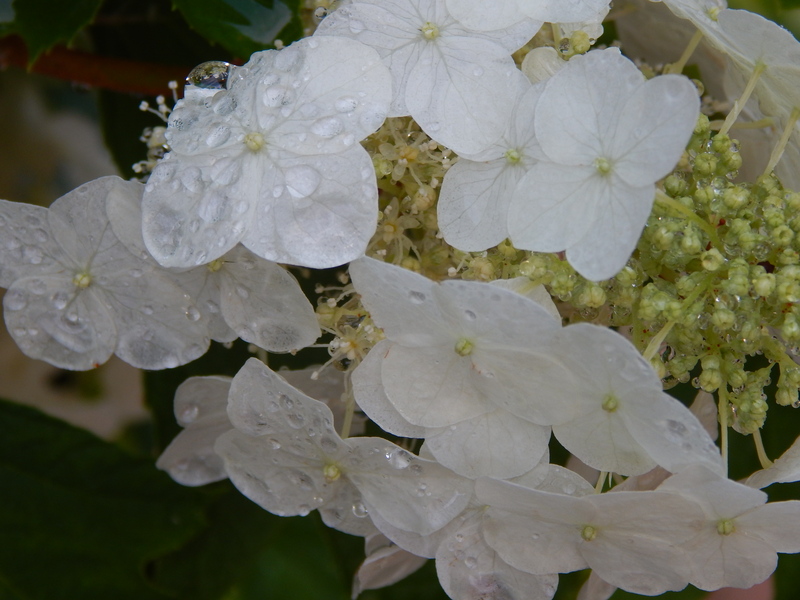 It’s not often you hear gardeners decry the aromas of a garden’s flora. One whiff of the titan arum Amorphophallus titanum arum–a.k.a. Corpse Flower–and you’ll find yourself spewing forth colorful adjectives to describe its memorable odor. Here a few that quickly come to mind: rotting meat, rotting flesh, an overflowing outhouse on a hot summer’s day. Certainly something to avoid. Well, not so fast. Like the dung beetle it attracts, Amorphophallus titanum arum drew my daughter and I and about 2,000 other inquisitive St. Louisans to the Missouri Botanical Garden for a rare glimpse and a sniff. In fact, you could not avoid the smell if you wanted to. 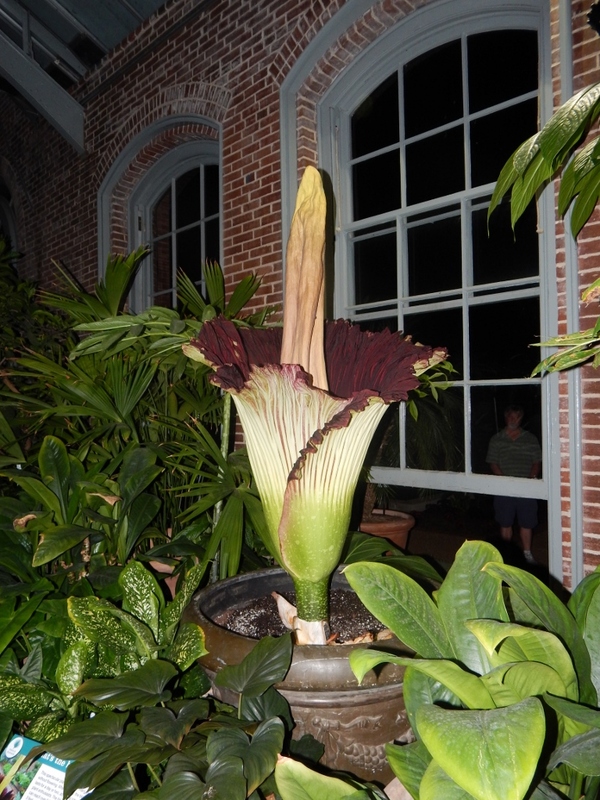 “Izzy” as the staff at the garden affectionately donned the titan arum, began its bloom late yesterday afternoon. This is a short lived wonder lasting about 24 hours. 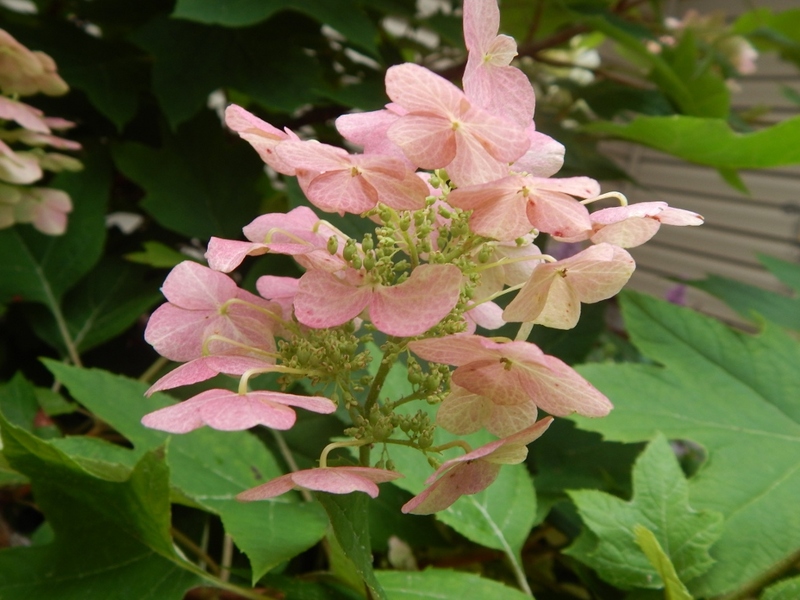 Midnight was the bewitching hour for the peak its bloom and its attracting stench. And we were there to take it in. Amorphophallus titanum arum, known as the Corpse Flower and affectionately named “Izzy” by the Missouri Botanical Garden Staff. It’s bloom may be short but its memorable fragrance lingers. MOBOT has 10 of these rain forest arums yet only three are growing at this time. Its bloom is a rare sight that lasts only briefly. 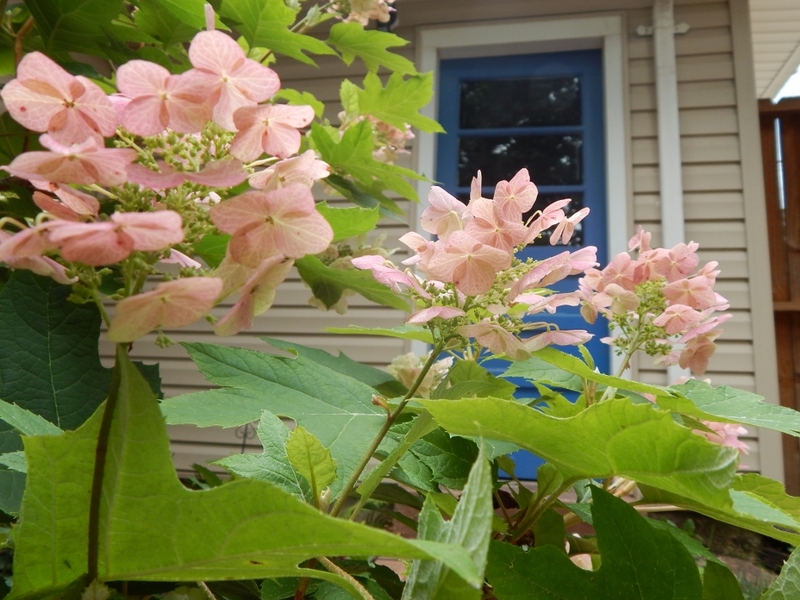 This one was planted in 2003 and until last night bloomed for the first and last time in 2012. There can be variation in when a titan arum blooms, and you could feel the excitement and giddiness among the MOBOT workers. (Of course, many of them had been on duty since early that morning, which could contribute to the giddiness.) They typically begin their bloom in mid to late afternoon and it peaks late at night. MOBOT kept its doors open until 2 a.m. and invited the whole town to the party. 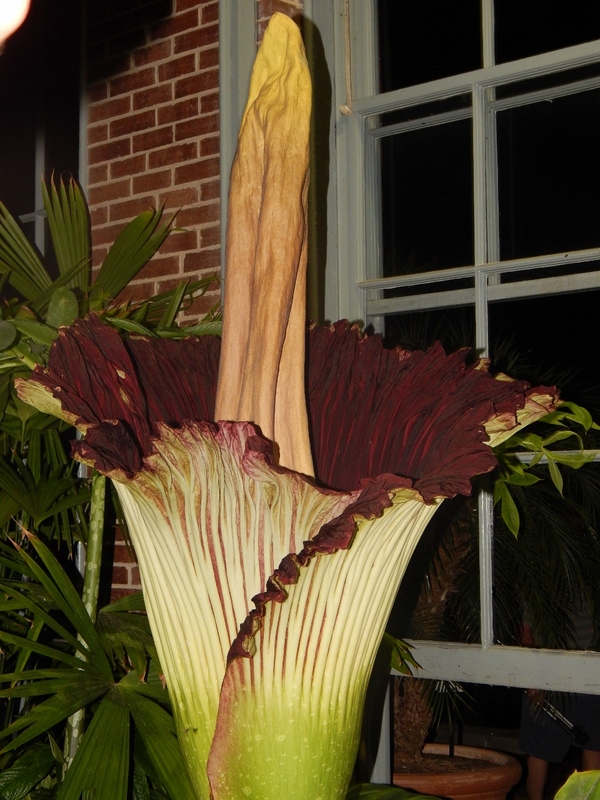 The titan arum was at peak bloom at midnight. We did not mind standing in line to see the titan. There was a festive atmosphere among the gathering crowd and we could smell titan before we saw it. The windows to the Linnean House were open, emitting a foul odor. As we entered the Linnean House, a woman was measuring its petal structure across, which was holding at 34 inches. The tall phallic-looking protuberance is called the spadix and the green-burgundy leafy structure is called the spathe. Hidden down inside the spathe are two ringlets of flowers around the spadix. The top one bears the male flowers. The male and female flowers open and pollinate at different times. So where does that beetle attracting stench come from? If I have this right, the spadix heats up to be as warm as a human, apparently, and this temperature vaporizes its fragrance, attracting the beetles and insects that pollinate this giant plant. I mistakenly thought the spathe was the flower. No, its juicy red color and texture serves to just look like a meat-like petal. And its leafy structure protects the flowers that are around the base of the spadix. The friendly guide describing the action before us shared that they hand pollinate the plant. No such luck for the lowly dung beetle. Categories: Musings | Tags: Amorphophallus Arum, Missouri Botanical Garden | Permalink.